Ministry of Home Affairs has published recruitment 2017 notification for 01 deputy fire adviser in the directorate general posts. All legible and interested candidates can apply on or before (21-03-2017). Further more information about salary details, application fee, educational qualifications and more details / information about these posts is mentioned in detailed below. 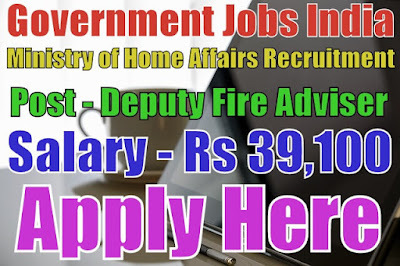 Salary/Pay and Grade Pay - For deputy fire adviser post, salary will be Rs 15,600 - 39,100 with Rs 5,400 grade pay. Further more information about salary details is mentioned in advertisement. Educational Qualifications - For the post of parliamentary interpreter, candidate should must have done 10th, 12th, graduation degree in fire engineering with 7 years experience in defence / civil fire service organization or it's equivalent / relevant / higher qualification from a recognized board or university. To know more see advertisement. Selection Method - For parliament vacancies, candidate will be selected on the basis of their performance in personal interview. Candidates should must be prepared for personal interview. Last Date - All candidates should must apply on or before (21-03-2017). Important Note - Application forms received after due date will not be entertained under any circumstances. Therefore application forms must reached before last date.